H3X and H4X grills feature the legendary Broilmaster cast aluminum grill head outfitted with a two-piece set of single-level stainless steel cooking grids, stainless steel H-style burner with separate left/right controls, stainless steel control panel, chrome-plated steel warming rack, and electronic ignition. Add a cart, in-ground post, or patio post with base – available in stainless steel or black – plus shelving or even a side burner. 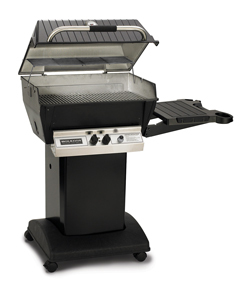 Or select a simple H3X or H4X grill package with one shelf and black mounting – cart, post, or patio post. Available in Natural Gas or LP. Conversion Kits optional.